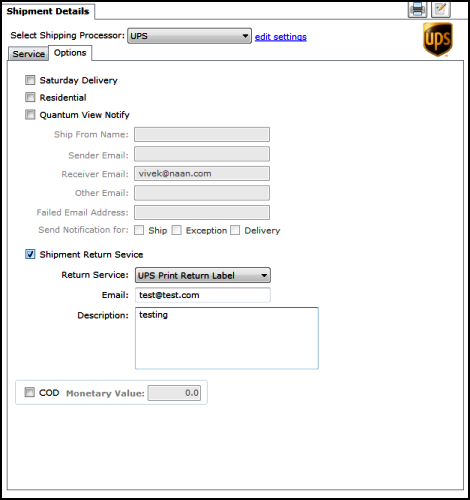 How do I print a Shipping Label from UPS Direct using Unify Desktop? 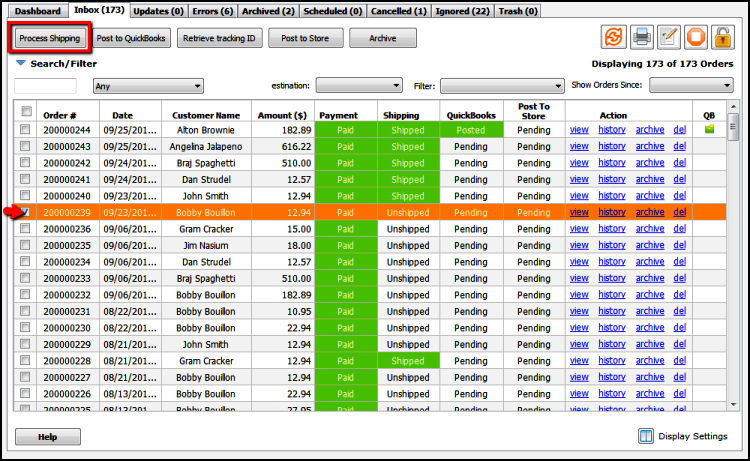 1) Select the order that you want to ship and click Process Shipping. This will open up the Shipping Module. The shipping charge and shipping method requested are also captured from the order. • If needed the Ship to and Ship from addresses can also be edited. Click edit, make the necessary modifications, then click save. 2) Click to modify any fields in the address and then click save / cancel as appropriate. 3) The ship to address can be validated by clicking validate address. 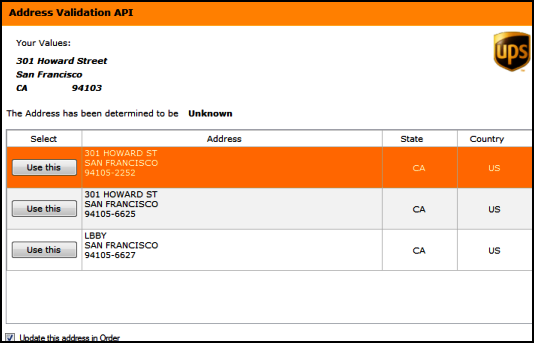 4) On the right hand side, make sure that UPS is the shipping processor. 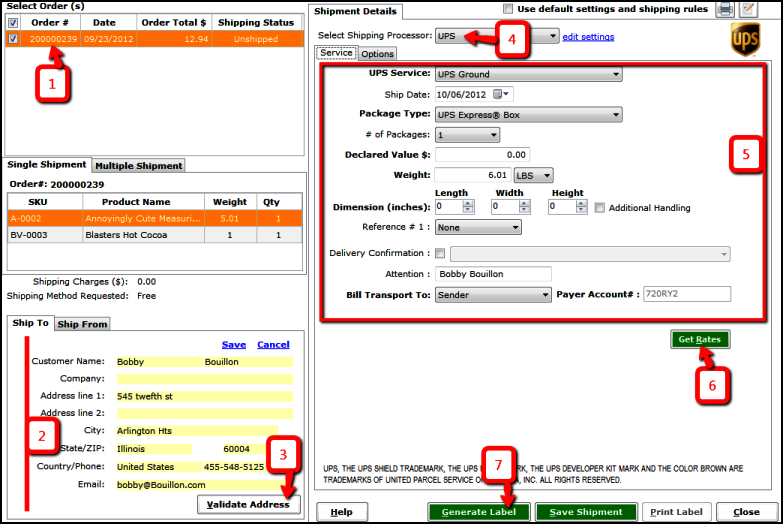 5) Select your shipping parameters for the current shipment. Go to the options tab if you want to set options for the shipment. If you want to print a return label as well, select the 'Shipment Return Service' and fill in the appropriate details. Remember that if you have this option selected, at the time you are printing your label, you will be asked if you want to print both the shipment and return label or only the return label. 6) Once done with the options, click the “Get Rates” button in the main process shipping window to get current shipping rates for the service selected. Click Use this, to use the service and standard rate. 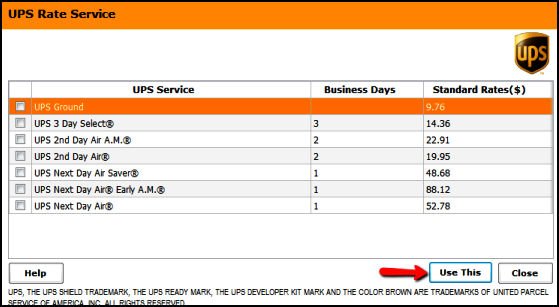 7) Click Generate label to create a label for UPS. The order will be marked as Shipped.